Doors open / welcome reception at 6:30 pm. Program begins at 7:30 pm. Becca Stevens is a premier speaker in the US, named a “Champion of Change” from the White House in 2011 and a 2016 Top 10 CNN Hero.​ ​She is an author, Episcopal priest and founder of Thistle Farms, a community of women healing from prostitution, trafficking and addiction. For 20 years, Stevens has​ ​​been an advocate for women ​who have survived childhood abuse, addiction and life on the streets​.​ ​​She began Thistle Farms in 1997, under the name Magdalene, as ​a residential ​program offering housing, medical and dental care,​ ​therapy, ​education free to women for two years. Residents and graduates are given employment through one of four social enterprises, allowing them to move towards independence. ​Last year Thistle Farms ​earned over $2.4M through its social enterprises and employed 50 residents and graduates. Thistle Farms Global helps employ more than 1,500 women and the Thistle national network has more than 30 sister organization. 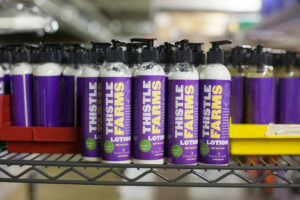 Thistle Farms Home & Body line, featuring products handmade by the women of Thistle Farms, are sold online, in 400 retailers as well as Whole Foods stores across the country. The Thistle Farms community believes that in the end, love is the most powerful force for change in the world.